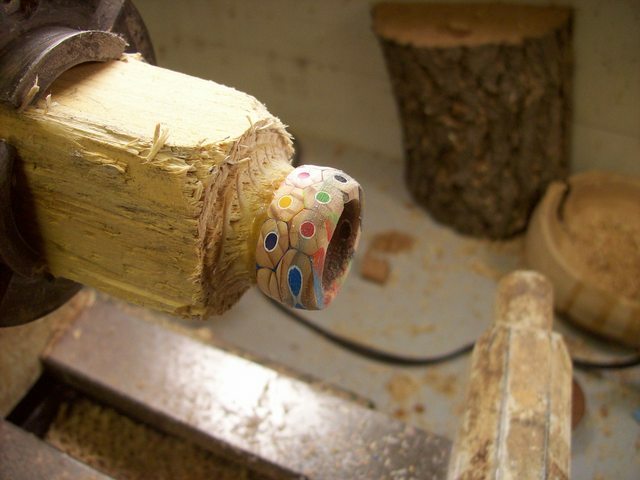 I turned a ring from a box of colored pencils. 12 pencils glued into a blank an then turned on the lathe. I like that a lot! Yet another thing to make me wish I had a lathe. drmfreek_ Thanks. You could adapt this pretty easily to a drill press or even hand drill project. Just with a slightly larger dowel and some rasps…. Totaly crazzy idea! Looks great! This is very cool Great thought process in this. Something in front of us and we don’t see it. Congrats on the fame you got on Reddit. I like it a lot I will be making some these soon. Thanks for posting. if you ever put it in your etsy store, I would totally buy one. Very inspiring! I already have ideas on how to use this for other applications. Thanks so much for sharing! Great job Peter! I love all of the different colors. Glad to see you posted the project here. Cool video too. I can’t wait to see other folks take on this! I like the idea. Very well thought out. What type or brand of colored pencils are good to use??? Thanks for the video also.